Israel has many enemies, but few have been deadlier than the terrorist group in its own back yard. Armed with the Koran and the gun, the people of Hamas are trained to hate Israel beginning at early childhood. For more than two decades, Hamas has terrorized Israelis through suicide bombings to thousands of rocket attacks. While Hamas military leaders were planning attacks on Israeli restaurants and buses, Mosab Hassan Yousef was growing up as the son of a respected Hamas founder. From an early age, he was groomed to be a Hamas "prince," to succeed his highly respected father in the group's leadership. 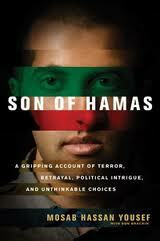 In his book, "Son of Hamas," Yousef recounts his amazing journey out from a culture of terror to freedom in Christ. He had watched his father struggle with an irrational internal conflict. "On the one hand, he didn't see those Muslims who killed settlers and soldiers and innocent women and children as wrong," he writes. "He believed that Allah gave them the authority to do that. On the other hand, he could not personally do what they did. Something in his soul rejected it. What he could not justify as right for himself he rationalized as right for others." When Yousef was first arrested for weapons possession as a youth, he endured brutal treatment at the hands of Israeli soldiers. He witnessed even worse treatment his fellow Hamas members in prison inflicted on other Muslims. They were "not trying to break me down or make me do bad things. They actually seemed to be doing their best to build me up, to make me stronger and wiser," he said. "As time went on I began to question my plan to kill the Israelis," he recalled. "These people were being so kind. They clearly cared about me. Why would I want to kill them? I was surprised to realize that I no longer did." Once, when Yousef was walking with a friend at Jerusalem's Damascus gate, a British man - a Christian - invited him to come to a Bible study. As he began to read the New Testament for the first time, he was deeply touched by the Sermon on the Mount and "thunderstruck" by Jesus' admonition to "love your enemies and pray for those who persecute you, that you may be sons of your father in heaven." Soon, instead of planning terror attacks, Yousef began to prevent them, as he worked with Israel's security agency, the Shin Bet. "He managed to give most known names today, of the wanted terrorists, to the Shin Bet, to pass some kind of information about those terrorists, to prevent, on his own almost, to prevent many suicide attacks and actually to save the lives of hundreds of Israelis and also to help prevent assassinations against Israeli officials," Ha'aretz Reporter Avi Isacharoff said. For ten years, Yousef would work for the Shin bet, preventing terrorist attacks on Israeli citizens, soldiers, and even political leaders such as current Israeli President Shimon Peres. In August 2005, Yousef's secular Muslim friend Jamal showed him a television program, where father Zakaria Boutros, the coptic priest, was "systematically performing an autopsy on the Koran." "Father Zakaria was cutting away all the dead pieces of Allah that still linked me to Islam and blinded me to the truth that Jesus is indeed the son of God," he explained. (1) In 2005, he was secretly baptized in Tel Aviv by a Christian tourist,(2) despite the danger it posed to him as a Shin Bet agent. In 2007 he left the West Bank for the United States and lived some time in San Diego, California, where he joined the Barabbas Road Church. In August 2008, Yousef publicly revealed his Christianity and renounced Hamas and the Arab leadership, thereby endangering himself and exposing his family in Ramallah to persecution. The Israeli newspaper Ha'aretz published Yousef's story of becoming a Christian. His father broke down and cried in prison, and was consoled by Muslim leaders and even some Israeli guards. But he refused to disown his son, knowing that it would bring a certain death sentence from Hamas. Mosab Yousef says he is a follower of Jesus Christ, but is only beginning to become a disciple. "So if you meet me on the street," he writes, "Please don't ask for advice or what I think this or that scripture verse means, because you're probably already way ahead of me. Instead of looking at me as a spiritual trophy, pray for me, that I will grow in my faith and that I won't step on too many toes as I learn to dance with the bridegroom." For a time, Mosab Hassan Yousef was threatened with deportation from the US after his request for political asylum was denied, since statements in his book about working for Hamas were interpreted as providing material support to a U.S.-designated terrorist organization," despite Yousef's explanation that they were "intended to undermine the group." His case then proceeded to the deportation stage, despite Yousef’s advocates warning that he would likely be executed by the Palestinian Authority if deported to the West Bank. On June 24, 2010 Shin Bet handler Gonen Ben-Itzhak, who for 10 years worked with Mosab Hassan Yousef under the cryptonym "Loai," revealed his own identity in order to testify on behalf of Yousef at an immigration hearing in San Diego. Itzhak described Yousef as a "true friend" and said "he risked his life every day in order to prevent violence." Yousef has also claimed that his aim was to help bring peace to the Middle East. He still hopes to return to Israel when there is peace.